Ideal for hoods/balaclavas to protect against flame, heat, smoke, and ash. 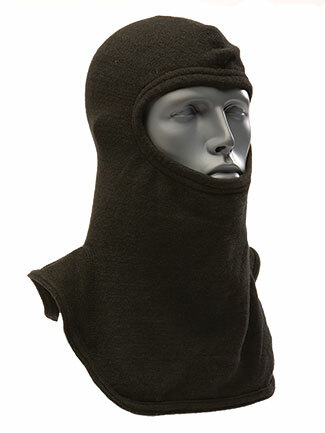 The CarbonX NSM 18-19 1X1 rib knit fabric is primarily used in our featured line of hoods designed to protect critical face and neck areas from flame, heat, smoke, and ash. Constructed to be truly non-flammable, our NSM fabric will not burn, melt, or ignite. Even after intense exposure to direct flame and extreme heat, it maintains its strength and integrity and continues to protect. It also limits heat transfer much more effectively than flame-resistant fabrics of similar weight. Our NSM fabric is comprised of a patented blend of high-performance fibers that provide an extraordinary level of protection. Its performance levels far surpass NFPA and EN standards. Lightweight at 7.0 oz/yd2, soft-to-the-touch, and flexible, our NSM fabric is comfortable next to skin, breathes extremely well, wicks away moisture, and dries quickly. CarbonX meets all No Melt, No Drip requirements for flame-resistant PPE. Click here for more information about our NSM 18-19 rib knit fabric, including testing data. The CarbonX NSM fabric is ideal for use in single-layer, double-layer, or triple-layer hoods. CarbonX offers single or dual eyeport style hoods in two different lengths.